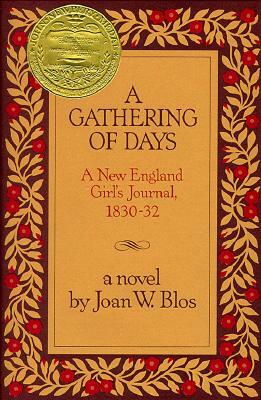 A Gathering of Days is a fictional journal of a 14 year-old girl living on a farm in New Hampshire in the early 1830s. During the year-and-a-half chronicled by Catherine, her beloved father remarries after having been widowed for seven years. His new wife is nice enough, but she takes away Catherine’s role as homemaker. Catherine also finds a mysterious note from a stranger asking for help, after which she decides to leave a quilt and some food for the stranger to find. Later she learns that the stranger was a runaway slave who was able to find his freedom in Canada. The most important event of the book is the death of Catherine’s best friend, Cassie. Throughout her journal, Catherine struggles to learn the importance of obedience, to her father, her new mother, her teacher, and to God. She comes to see her father’s marriage and her friend’s death as powerful tests of her faith and trust. I like this novel for the things it made me think about. Catherine’s reaction to the struggles she faces is very unlike the reaction I would have had at her age. She sees strife as a way to strengthen her resolve to be an obedient child, rather than as an excuse to turn away from God. It is this mindset which places this character in another century; and I like that. Today, our reaction to our circumstances seems to be based on what we want, rather than what is wanted from us. In Catherine’s schoolhouse, the children learned to read, write, and spell through Proverbs and other religious instruction. These moral writings are not emphasized to us today, and so, are not truly taken to heart. It’s strange that I can feel glad that I didn’t grow up in such an austere and harsh setting at the same time that I feel regret and loss that I didn’t grow up in a time in which simple truths were the guideposts for living. The world today seems very complicated; I often wish that a handful of proverbs were our compass, rather than handmade philosophy and cynicism. These are the things this book made me reflect on, for which I’m grateful. While I did enjoy the way this book was at once simple and complex, I still felt that something was missing. I like minimalism and simplicity, truly, I do. But at times this book was too simple. The tragedies and surprises Catherine faced should have merited a lot more feeling and depth. For example, when her friend died, Catherine wrote “oh how I did weep” but I never got a feeling that she was deeply anguished. When her new mother came to live in her house—the house that Catherine had been running since the age of seven—her dismay was only hinted at, never spoken of outright, which it should have been in a journal, if nowhere else. I kept waiting for an explosion of feeling from this little girl who always seemed to be trying to contain and control her feelings. But that explosion never came, and this void of emotion is what was lacking in this novel. I would recommend this book to girls aged 9 to 14, especially girls interested in diary books and American history. This would perfectly suit readers of the American Girl books. I rate this book as 3 ½ boots. It was good, definitely, but I wasn’t embedded enough in the story for this to have been a true book trek. It felt more like skipping on pavement rather than being pulled down into a dirt road. I’m looking for a rugged path that truly requires boots in order to travel. The ½ boot is because I liked the reminders the book gave me to appreciate simple truths and not to look for complicated explanations for life’s mysteries.